Fenders and stirrup leathers assembly. As on Trooper saddle. Measurement from base of buckle to tip of tear drop shape: Medium 15"; long 18". 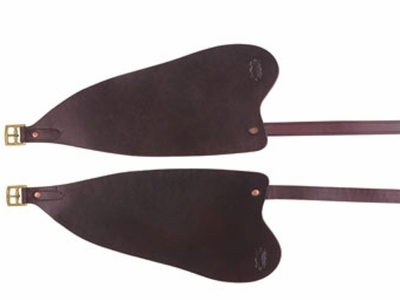 Stirrup leathers: M- 57"; L-61". Fits inseam: M- 31"- 39"; L- 33"- 40". Black or brown. Stainless Steel buckle. Copper riveted. Sold in pairs.